This is one of the best short Christmas stories for kids. The light of the full moon lit the whole meadow brightly. The meadow was covered with snow, and there stood a lame little donkey all alone in the cold night. Also, read When Santa Lost His Ho-Ho-Ho. The little had been there; he arrived with a small traveling fair in spring. The owner did not mind leaving him behind when the fair moved further as he was also limping back then. The donkey didn’t even mind staying back as now he didn’t have to pull a cart full of children around the short circuit of the fair. There was always plenty full of grass around him to eat, and the adjoining farmers threw him cabbages, turnips, and carrots once in a while. They also made sure that he always had enough water to drink. But he left lonely. In particular, tonight, as it was Christmas Eve. And all donkeys knew about Christmas. After all, it was his ancestors who carried mother Mary to Bethlehem. Just when he heard the clock struck midnight, from a faraway village, he uttered a long and sad bray. Only then he heard a jingling sound; it became louder as it approached him. He got excited to see who it was, as it was Christmas Eve. It was a huge man wearing a furry coat and was carrying a bulky bag with him. He had a bushy white beard. Even though the donkey knew the answer to his question but he still asked it, “who are you?” The man replied, “I am known by many names all over the place, for some I’m Sinterklaas, and for some Kriss Kringle. More often known as St. Nicholas and Santa Claus. I prefer Father of Christmas!” You may also like to read, How Santa Got His Job. Later Father of Christmas explained how he has to go to Green Meadow, which was twelve miles away. The lame little donkey offered to help him as the man could not travel with such a bulky bag all by himself. They chatted on their way and time passed by swiftly. They stopped at four houses, as Father of Christmas dropped mysterious gifts at their doorsteps. Finally, they arrived at Green Meadow Bottom, the home of Appleyards. Father of Christmas kept the gift the doorsteps and said “farewell old chap!! Take care, and I’ll see you next year!” the donkey looked around but the Father of Christmas was nowhere to be seen. Mr. Appleyard appeared on the doorsteps, he examined the bag and exclaimed: “father of Christmas has been here!” He called Martha and bent over to get the bag. By this time the three boys ran towards the donkey excited, ignoring the bag full of gifts. “Look daddy!” exclaimed one of them, “there is tag around his neck.” Also, read Santa’s Beard. 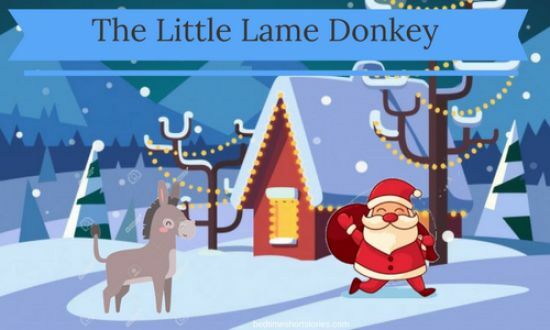 When Mr. Appleyard checked the donkey’s collar, it was written “This is a special gift for you, he is lame. Please take good care of him. Merry Christmas.” And so they did. They loved him dearly, and the lame little donkey was never alone.